This week’s sales are just too good to not write about. Ulta surprised us and launched their 20% off EVERYTHING sale Today- Saturday. You need to be a member but you can sign up HERE. And of course, the long-awaited Sephora sale that I’ve been talking about all week– you also need to be a beauty insider for this so sign up HERE. Since Ulta usually blocks their premium brands from their coupon codes I’m extra excited about this because everything is discounted! Majority of the makeup and self-tanner I use is from Ulta! I go to Sephora for skincare and the remaining makeup pieces that round out my stash. And of course Olaplex. You need to buy Olaplex on sale RIGHT NOW. So here’s the deal. Below I’ve listed all of my favorite items & the items I really want. I broke them up into categories based on which store, and what the item type is. If you have ANY questions you know where to find me! *If there are arrows next to the items swipe right because there’s more to see! Skincare is not one size fits all. If you have any specific questions about products please feel free to reach out! Sephora has some really cool new brands like The Ordinary, which I am so excited to try! Also, the Tatcha Violet-C Radiance Mask is AMAZING! Ulta has my favorite product right now. Hey Honey Good Morning Serum is the best hydrator for under makeup I have ever found! They also sell my favorite cleanser! I am a huge self-tanning fan and Ulta has all of my favorite products! Jergens foam is the best and most affordable product I’ve found for a body tan. Just make sure you use a mitt! This texturizing spray is the best I have ever used! Also, who doesn’t want the Dyson hair dryer?? What are you planning to buy this weekend? Hurry because things are going to sell out FAST!! My favorite blog post(s) of yours are all the ones on skincare! 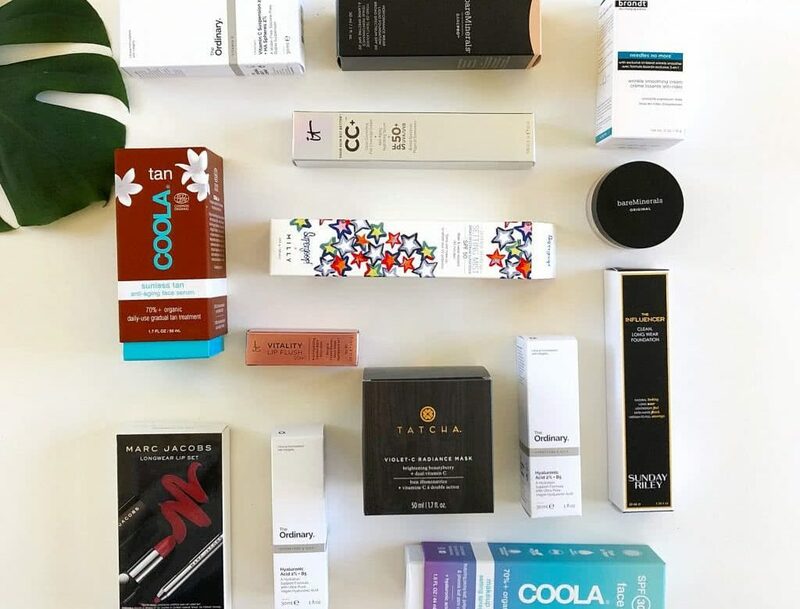 I don’t know how you do it but you can sell me anything when it comes to face products- Makeup, wash, lotions, eye cream, serums (that I never knew even existed) ALL of it. You look amazing, your stories are hilarious and you’re so informative! I’ve shared so much of what I’ve learned from you with friends. Thanks for starting this adventure of yours. It’s so great and you’re so great at it! All these products are great recommendations, but I’ve been dying to try the Olaplex Hair Perfector No. 3. I’m going to order it from Sephora right now, thanks for the rec! Not a huge ulta fan but I love a good Sephora run! !